I'm buying a vehicle. Can I trust the information contained on the door data plate (patent plate, vehicle certification label, door sticker)? Can I rely on this tag to tell me about how this car was built? 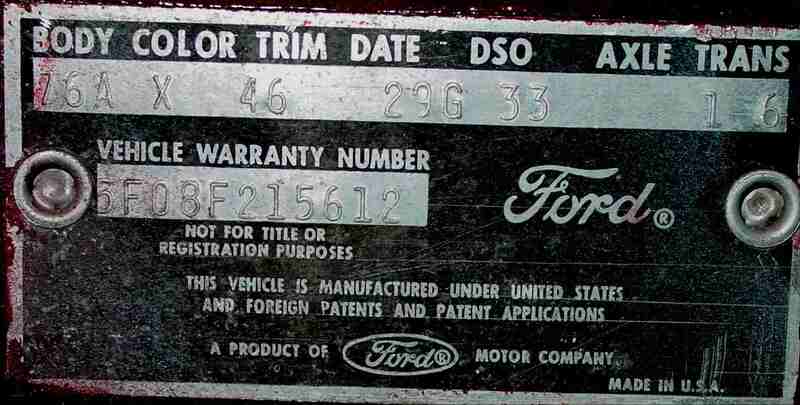 The door data plate, also known as a patent plate (or a vehicle certification label for the 1970 model year and later) contains a lot of useful information about how the particular Ford, Lincoln, or Mercury vehicle was built. The problem with them is they are removable and reproductions have been available for over 25 years. "How can they make reproductions? Isn't that illegal?" No, it is not illegal as they are not an official document for the vehicle. Changing data on the data plate is no different, from a legal perspective, than changing the color of the upholstery in the interior. It is for this reason that it is best not to rely on the information contained on a door data plate when considering a purchase where authenticity is important. For 1967 and later model years, it is best to order a Marti Report. See the tab labeled 'Marti Reports' to the left on this webpage to get more information. This is the only way to guarantee how a vehicle was delivered from the factory. For 1966 and earlier model years, it takes skill to know what to look for. If you don't have that skill, it is best to invest in an expert.